Mother’s Day Just Passed and I guess my need to say a few things about grief is related to just that. It’s a funny thing, but when tragic things happen to you, people sometimes say the strangest things. Both my parents died, my 52yo brother-in-law died and I got divorced. It all happened within 3 years of one another. I was flooded with grief that was so deep I was afraid I might drown. Mostly, in the beginning especially, I was grateful that anyone acknowledged my loss, no matter what strange words came out of their mouths. I knew they were trying to connect. But, at some point, 5 or 6 months in, when the shock and numbness wore off and when I could no longer be distracted by the “business” of death as the Executor of the Will, the pain became more intense & Reality was making its way in. Posted by Donna Strickland in Behavioral Health, Resiliency. Why Resiliency Matters: Getting through the long dark nights of the soul. Mental health is a key component to a person’s overall health. Mental Health is Health. They can’t be separated out from one another. Although we have spent a great deal of time and energy in this country trying to split ourselves into “parts and pieces”, overall health absolutely includes one’s mental health, and one’s relationship to alcohol and/or drugs. May marks Mental Health Awareness Month in the United States. It’s a time when we reflect on just how much our mental health matters, and what we are doing that actually works to help people stay mentally healthy. One thing you can do is strengthen your resiliency. It emerges as one of the key factors that strengthens our mental health. 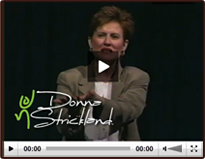 Posted by Donna Strickland in Behavioral Health, Free Resources, Resiliency. Leadership: Are Your Gen X’ers Engaged? How is Retention Related to Team Development and Employee Engagement?